“Once Upon a Time” tells of eternal love, namely that between two gods across thousands of years. It starts with Bai Qian, a woman who lives in the Heavenly Realm of Qiuqiiu drinking booze and hanging out with her friend kasdf, who himself can turn into a phoenix and changes multiple colors. When she visits another realm (an underwater place that gives this epic a “Valerian” moment), she comes across a crown prince named Ye Hua (Yang Yang), who has a secret for her: That they were in love once ago, and that his child named A Li is her own. 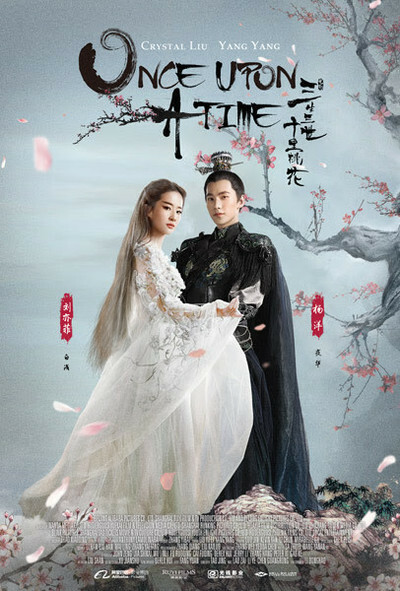 Many questions abound, for the viewer and Bai Qian, who eventually re-falls in love with Ye Hua, and learns the true story of their connection, which includes wire-fu battles gods, a 70,000-year age difference, and Bai Qian's ability to turn into a white fox with nine tales. True to the tale's original book title, their love story is one that spans Three Lives, Three Worlds, Ten Miles of Peach Blossoms and manages to make quite a headache when it comes to following the first two concepts. The titular distance of fruit, on the other hand, concerns the pat singularity that fate has just one peach blossom in store for all of us. That's a rare bit of poetry in a movie that explains in part why fireworks, Hallmark cards and acrobats will always captivate people, in one way or another. This whole enterprise is filmed, with seemingly few exceptions, on large sound stages. Yes, the sets themselves are filled with floral detail and every bright color on the spectrum, and the green screen work creates backdrops that seem to go on for thousands of miles as softly lit, heavenly landscape (not unlike “The Great Wall,” which director Zhao Xiaoding was the cinematographer for). But the flat nature of this proves to be constricting, creating a deadened spectacle of characters merely walking and talking (and sometimes fighting) around green screens, akin to the famously lifeless blocking in George Lucas’ “Star Wars” prequels. Proving that even the most experienced cinematographers can be weak directors, Xiaoding boxes in his grandiose characters with consistent medium shots, making us all the more aware that we’re not seeing a fantasy world come to life, but sets with backdrops and limited walking space. The effect is claustrophobic and frustrating: Before it even starts, “Once Upon a Time” brandishes a whopping ten production logo videos, and yet even with all of that money going into lavish costumes and luminous scenery, it can only present a viewfinder’s perspective of its cinematic universe. “Once Upon a Time” seems prepared for the smallest screens possible, with any screen larger more of a gift to the financiers than the viewer. This is a busy, precious epic of profoundly limited imagination, where it doesn’t have a vision so much as a shiny color palette. The story tries to counter such restrictions by going all out with the fantasy, creating a world where there are seemingly few rules concerning mortality, whether or not you can turn into an animal, or how Bai Qian is a blank slate primed for a feature’s amount of expositional dialogue and flashbacks. It all becomes a textbook reminder about how even when fantasy stories go on their own paths, they still need some sense of order to guide the viewer along, otherwise even the largest productions fade to superfluousness. “Together forever” is not just the emotion at the heart of the story, it becomes the sole piece of logic to go from one albeit pretty sequence to the next. “Once Upon a Time” struggles to leave an uncanny valley when it comes to providing simple albeit stylized amusement. It wants to have a massive scope with endless realms and hundreds of years to its characters, but it always feels so small. And even with the goal of providing awe or guffaws, of which it wants to be a heavily designed, family friendly fairy-tale with intermittent wire-fu sequences, the movie is constantly at battle with being so bloated and confusing. There are sporadic shiny and/or silly moments that will carry curious viewers all the way to the end of the movie, which features a big battle between barely-shown characters and eternal declarations. But when love is handled as cavernously as this, nothing really matters.